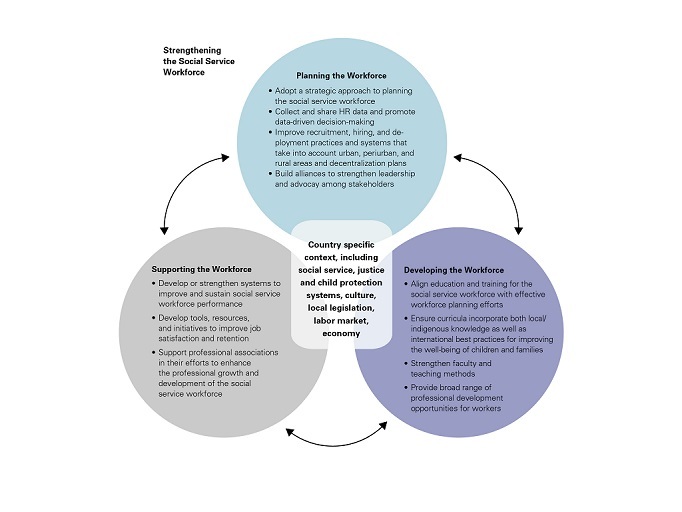 The framework refined at the Social Service Workforce Strengthening Conference in 2010 outlines strategies to better plan, develop and support the workforce. It is intended as a guide to support country efforts to strengthen the social service workforce and systems. This framework – like the work of the social welfare workforce – takes place within a country-specific context that includes social welfare, child protection, justice, education and health systems, and cultural, legislative, labor market and economic factors that have an impact on all three areas of the framework. It will be very helpful if plans are built after undertaking an environmental scan that takes into account these broad and sometimes overlapping aspects of context. Activities include: adopting strategic approaches to planning the social service workforce, which entails such actions as carrying out assessments to identify human resource gaps; using HR data in decision making about financing; improving recruitment, hiring, and deployment practices; and advocating for intraministerial dialogue and coordination to generate the political will, legislative frameworks and resource allocation to strengthen and support the social service workforce. Read more here. Activities to develop the social service workforce include: designing pre-service education and in-service training programs that are aligned with needs identified by workforce assessments; developing appropriate curricula; and strengthening faculty and teaching methods. Read more here. Effectively supporting the social service workforce entails putting in place policies and practices that promote effective staff induction and orientation, supervision and mentoring and job satisfaction and retention. It also involves supporting professional associations in their efforts to enhance the professional growth and development of the social service workforce. Read more here.